Click the “Start Activity” button to indicate you have reviewed the CME information for this activity. This continuing medical education activity is provided by The Medical College of Wisconsin. Collaborative Partner: HealthmattersCME. 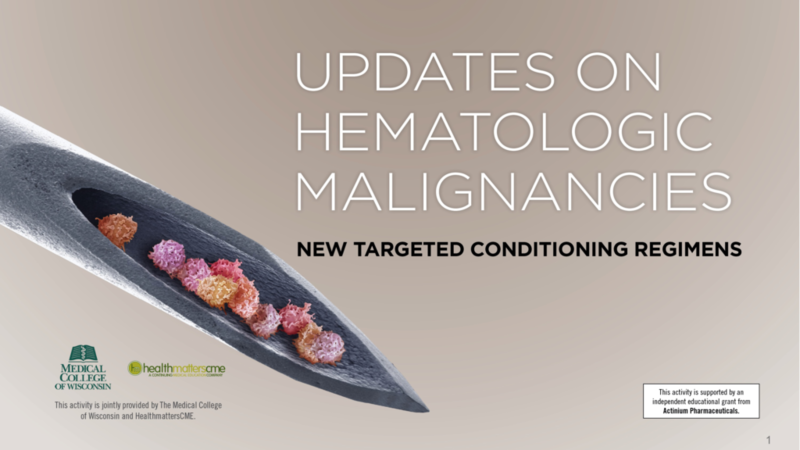 This CME-certified activity, Updates on Hematologic Malignancies: New Targeted Conditioning Regimens, will provide focused instruction to healthcare professionals caring for patients with MDS, AML, and ALL. The activity is designed to address clinical practice gaps as identified by our expert faculty and the published literature. The activity will focus on increasing clinician knowledge and the ability to integrate changes into practice to improve patient outcomes. The program will highlight current limitations in the standard of care for patients with MDS, AML, and ALL, current NCCN clinical guidelines, new research discoveries and pharmacologic agents, and current research demonstrating improved treatment outcomes for high-risk patients with relapsed disease or difficult-to-treat cytogenetics. Topics for presentation will include: proper selection of dose intensity for chemotherapeutic options in MDS and AML, conditioning regimens for ALL prior to HSCT, and improvements in clinical outcomes for new and emerging targeted-conditioning regimens. The intended audience for this activity is hematologists, oncologists, bone marrow transplant specialists, and other health care professionals who provide care for patients with hematologic malignancies. The Medical College of Wisconsin designates this enduring material for a maximum of 1.0 AMA PRA Category 1 Credit™. Physicians should claim only the credit commensurate with the extent of their participation in the activity. This enduring material is approved for 1 year from the date of original release, April 25, 2017 to April 25, 2018. Sergio A. Giralt, MD discloses that he has been on the Advisory Board Amgen, Celgene, and Takeda. He also was a speaker for Actinium, Jazz, and Sanofi. David I. Marks, MBBS, PhD discloses that he has been on the Advisory Board for Amgen and Pfizer. He also was a consultant and speaker for Amgen and Pfizer. He also has done research for Celgene. Bart L. Scott, MD discloses that he has been a speaker for Actinium, Agios, Alexion, Celgene, and Novartis. The educational content of this program has been peer reviewed by The Medical College of Wisconsin. The Medical College of Wisconsin, Carden Jennings Publishing, and HealthmattersCME report the following relationship(s): No relevant financial relationships to disclose. Signed disclosures are on file at The Medical College of Wisconsin. The material presented at or in any Medical College of Wisconsin, HealthmattersCME, or Carden Jennnings Publishing Company, Ltd, continuing education activity does not necessarily reflect the views and opinions of Medical College of Wisconsin, or HealthmattersCME, or Carden Jennnings Publishing. Neither Medical College of Wisconsin, or HealthmattersCME, or Carden Jennnings Publishing, nor the faculty endorse or recommend any techniques, commercial products, or manufacturers. The faculty/authors may discuss the use of materials and/or products that have not yet been approved by the U.S. Food and Drug Administration. All readers and continuing education participants should verify all information before treating patients or utilizing any product.